Photographers, take note. A startup called JPEGmini is introducing a new photo compression technology for JPEG photos which reduces the overall file size (by up to 5 times), while preserving the photo’s quality and resolution. The technology is designed specifically with the Web in mind, as more photographers, both amateur and professional, use online storage for photo archival purposes. With JPEGmini, photos can be uploaded, emailed and shared faster, while saving on storage and bandwidth costs. Sounds great, of course. But the question is: does it work? According to the company, the JPEGmini technology works by analyzing the input image using a unique quality detector which imitates the human visual system. Based on this analysis, it applies the maximum amount of compression which will not cause visible artifacts. The second part of the system is a JPEG encoder, which adapts the JPEG encoding process to the original photos, creating the most compact representation of the photos that is possible under the JPEG standard. So, to be clear: JPEGmini is not a new file format, it uses the JPEG file format. And in some cases, it can achieve a recompression ratio of up to 5 times, or an 80% reduction. The key phrase here is “some cases.” JPEGmini doesn’t always surpass the capabilities of current technology, it seems. Says San Francisco-based professional photographer Jim Goldstein of JMG Galleries, in tests, JPEGmini achieves greater file size savings on larger Web images than Photoshop did. 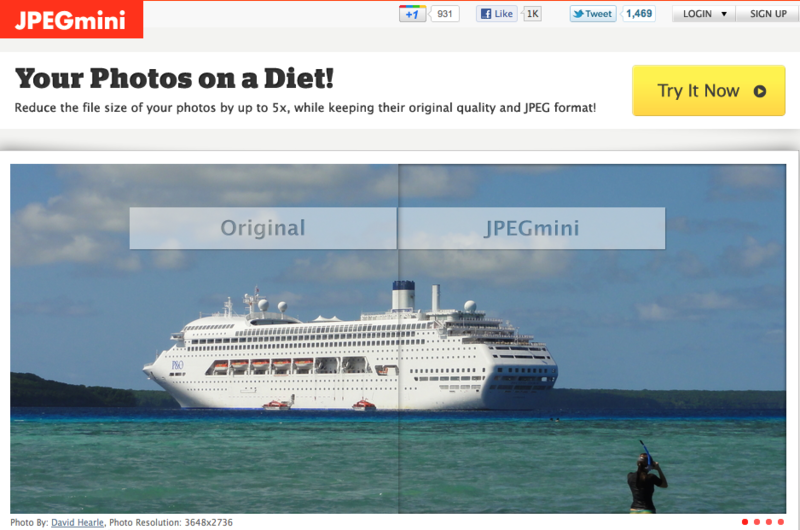 But with smaller images, Photoshop’s “Save for Web” setting (at 60% quality) did better. (More details on the tests here). This seems to confirm what JPEGmini itself says – the higher the original JPEG photo resolution, the greater the file size reduction it can offer. (Only photos 8 MP and higher can achieve the 80% reduction rate using this technology, for example). In addition, it’s worth noting that JPEGmini preserves all the photo’s metadata. Still, for professionals, the best savings and balance of image quality would come from saving a JPEG for a RAW file, and ideally, doing compressions in batches, not one-by-one as with JPEGmini’s service, explains Goldstein. Correction: JPEGmini lets you upload folders. So perhaps professional photographers don’t have need of JPEGmini, after all. But other consumers might…especially those who don’t own a copy of Adobe Photoshop or Lightroom, for example. The technology could be integrated into consumer electronics, like phones and digital cameras, too, as a way to save storage space and bandwidth when saving or sharing photos. JPEGmini was developed by ICVT, an Israeli startup company based in Tel-Aviv. Its founder, Sharon Carmel, previously co-founded Emblaze, which developed the Internet’s first vector-based graphics player, preceding Macromedia Flash, and BeInSync, a P2P sync and backup company acquired by Phoenix Technologies in 2008. JPEGmini is self-funded.